Please email me to get full CV. Lev Manovich is the author of Software Takes Command (Bloomsbury Academic, 2013), Soft Cinema: Navigating the Database (The MIT Press, 2005), and The Language of New Media (The MIT Press, 2001) which was described as "the most suggestive and broad ranging media history since Marshall McLuhan." Manovich is a Professor at The Graduate Center, CUNY, and a Director of the Software Studies Initiative which works on the analysis and visualization of big cultural data. In 2013 he appeared on the List of 25 People Shaping the Future of Design (between Casey Reas at no. 1 and Jonathan Ive at no. 3). Lev Manovich (www.manovich.net) is a Professor at The Graduate Center, City University of New York and founder and director of Software Studies Initiative. Manovich is the author of Software Takes Command (Bloomsbury Academic, 2013), Black Box - White Cube (Merve Verlag Berlin, 2005), Soft Cinema DVD (The MIT Press, 2005), The Language of New Media (The MIT Press, 2001), Metamediji (Belgrade, 2001), Tekstura: Russian Essays on Visual Culture (Chicago University Press, 1993) as well as over 100 articles which have been published in 30 countries and reprinted over 400 times. The Language of New Media is translated into Japanese, Korean, Italian, French, Spanish, Polish, Latvian, Lithuanian, and Slovenian, and is used a textbook in hundreds of programs around the world. According to the reviewers, this book offers "the first rigorous and far-reaching theorization of the subject" (CAA reviews); "it places [new media] within the most suggestive and broad ranging media history since Marshall McLuhan" (Telepolis). In 2007 Manovich founded Software Studies Initiative. The lab is developing Cultural Analytics: computational analysis and visualization of massive cultural visual datasets in the humanities. The lab's past and present collaborators include Museum of Modern Art in NYC (MoMA),Getty Research Institute, Austrian Film Museum, Netherlands Institute for Sound and Image and other institutions who are interested in using its methods and software with their media collections. Manovich was born in Moscow where he studied fine arts, architecture and computer programming. He moved to New York in 1981, receiving an M.A. in Experimental Psychology (NYU, 1988) and a Ph.D. in Visual and Cultural Studies from University of Rochester (1993). His Ph.D. dissertation The Engineering of Vision from Constructivism to Computers traces the origins of computer media, relating it to the avant-garde art of the 1920s. 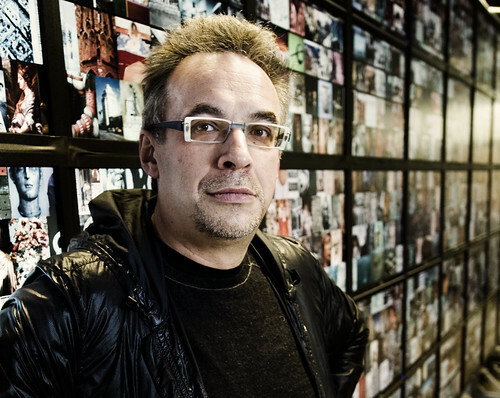 Manovich has been working with computer media as an artist, computer animator, designer, and programmer since 1984. His art projects have been presented by, among others, Chelsea Art Museum (New York), ZKM, The Walker Art Center, KIASMA, Centre Pompidou, ICA (London), and Graphic Design Museum (Breda, NL). He received grants from National Science Foundation (NSF), National Endowment for the Arts (NEH), Mellon Foundation, and other agencies. He was awarded Guggenheim Fellowship, Digital Cultures Fellowship from UC Santa Barbara, a fellowship from The Zentrum für Literaturforschung, Berlin, and Mellon Fellowship from Cal Arts. Between 1996 and 2012, Manovich was a Professor in Visual Arts Department at UCSD where he was teaching classes in digital art, new media theory, and digital humanities. In addition, Manovich was a visiting professor at California Institute of the Arts, SCI-ARC, UCLA, University of Amsterdam, Stockholm University, University of Art and Design (Helsinki), Hong Kong Art Center, University of Siegen, Gothenberg School of Art, Goldsmiths College (University of London), De Montford University (UK), and University of New South Wales (Sydney). Currently he on the faculty of European Graduate School (EGS). Manovich is in demand to lecture on digital culture around the world. Since 1999 he presented over 500 lectures, seminars and master classes in North and South America, Asia, and Europe. In 2013 he appeared on the List of 25 People Shaping the Future of Design (between Casey Reas at no. 1 and Jonathan Ive at no. 3).